We were very pleased with the first batch of Starbucks Energy + Coffee drinks and now they are introducing a new flavor to the lineup! Today we cracked open a can of Cinnamon Dulce and was greeted with coffee aroma similar to the other SBX drinks and a very slight hint of cinnamon. Once poured into a glass this drink looks THICK and RICH with a deep caramel color. The first sip I took was rather rough…. (NOTE: EDG is a not a fan of cinnamon) I noticed a strong cinnamon taste and almost thought I was sipping out of an ashtray…. A few more sips later the ashtray/cinnamon taste was going away and it became more drinkable! I had another colleague (who enjoys cinnamon) sample this drink and he liked it start to finish. I could drink this again BUT I would prefer one of the other Starbucks Energy drinks. I’m sure plenty of people out there will really enjoy this drink! If you like cinnamon + coffee I highly recommend you try this drink once it hits the market on Jan 22, 2009. This entry was posted in Caffeine, Coffee, Ginseng, Guarana, Insoitol, Taurine, Vitamins and tagged cinnamon, Coffee, dulce, starbucks on January 21, 2009 by Enery Drink Guru. HOT OFF THE PRESS: The rumored Starbucks energy coffee drinks are here and in my hands at the EDG labs! We have all 3 flavors that we will be sampling for this review. The minute after the FedEx driver left I popped these cans into the fridge and wanted to sample one later that day! The overall design of the cans is good, has the same similar style that other coffee energy drinks are using. The well known Starbucks green circle logo is top dead center to confirm what you are drinking. I like the can design and layout, they are using the 15 oz can which is probably going to become the standard for future tall boy energy drinks. We have chosen to sample the Coffee drink first to use as our baseline. Once we opened this can you smell a nice strong coffee aroma that is very inviting and peaks your interest. SBX Coffee has a nice caramel color, non carbonated and displays a thick rich look when poured into a glass. (The aroma smells great but I am having flashbacks to Monster Java that just wasn’t too good) First sip is very robust and you immediately notice how SMOOTH and velvety this drink is. I was in shock how good this tasted, let me try another swig to make sure…. yup it’s that friggin good. I didn’t notice any aftertaste and there was no film on the tongue afterwards! I have sampled many other coffee + energy drinks and they don’t stand a chance against the Starbucks ones! Mocha was the can we decided to sample next and it was very similar in aroma and color but possibly a tad mellower. The texture and flavor were still smooth as silk and you could possibly taste a slight chocolaty overtone but nothing overpower which was nice. Vanilla was the final can of the trio, pretty much the same applies here but add a slight hint of vanilla. I thought the aroma of the vanilla drink was stronger than the actual taste. 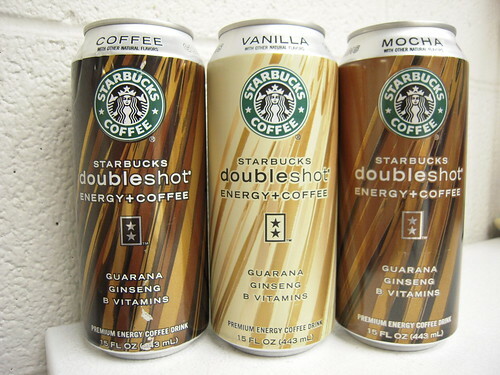 Doubleshot includes the following goodies: Guarana, ginseng, caffeine, taurine, vitamin A, B6, B12, C +D. Starbucks uses sugar and not HFCS which is a nice touch also. Look for this on your local store shelves later part of June with an estimated price of $2.59/can. Conclusion: Starbucks has a winner on their hands, Monster Java might as well pack it up and head home. I am not sure if it’s because SBX uses better coffee or ingredients but Monster Java has such a harsh taste. If you’re looking for a great morning drink for a hot summer day, look no further! I felt a nice little pick me up boost but no shakes like some of the other energy drink! EDG Recommended! This entry was posted in Caffeine, EDG suggested, Energy Drinks, Ginseng, Guarana, Taurine, Vitamins and tagged Coffee, doubleshot, energy + coffee, mocha, starbucks, vanilla on June 6, 2008 by Enery Drink Guru.